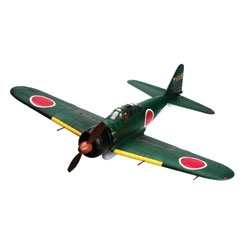 E-flite has captured the true character of the infamous Japanese A6M5 Zero in a fun-to-fly micro BNF Basic recreation. Molded using durable smooth-foam construction, the A6M5 Zero 300 comes out of the box fully-painted and -loaded with scale details. The fit and finish of this well-powered electric, 4-channel warbird has been painstakingly engineered while taking very few design liberties to achieve excellent flight performance. This conveniently-sized E-flite® RC replica of the legendary warrior can also proudly serve as a display model that easily secures to the included static display stand. Yet the beauty in this model is that you can also enjoy an uncompromised RC warbird experience in no time at all. Just connect the recommended 2S 7.4V Li-Po battery, bind to your favorite DSM2®/DSMX® compatible transmitter and fly.